Sunflame has been the leader in manufacturing kitchen essentials for over 3 decades by using latest technology to attract customers with its offerings. When it comes to buying gas stoves, Sunflame brings a huge range and variety in its lineup. These gas stoves come with 2, 3 and 4 burners. Whether your choice is gas stove with stainless steel base or toughened glass top, Sunflame has got you covered. In addition, these stoves also come with manual and automatic ignition options. So, you can choose one as per your needs. A lot of these stoves have brass burners which are thermal shock proof and easy to operate. In addition, Sunflame gas stoves are wear and tear resistant and rust proof. They are well known for their even heat distribution and flame distribution system. They come with small and big brass burners for diverse cooking needs. Sunflame GT Pride 2 burner gas stove is your best companion to cook different dishes. Its high quality finish and manufacturing sets this gas stove ahead of the rest. It features 2 highly efficient brass burners with dimensions of 85mm x 85mm. It is the best choice for small families and bachelors who cook several food items at a time. 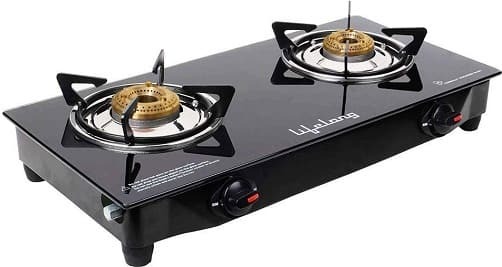 These brass burners don’t consume much LPG as compared to other types of burners and they are also very durable and can deal with heavy use. You can cook veggies, try the latest recipe, curries, chapattis, rice, and a lot of dishes with this gas stove. Add modern appeal to your kitchen with Sunflame 2 burner Shakti gas stove. You can have stylish look and design to your kitchen and ease your day with advanced features. It is an ISI certified cooktop with 2 burners for safe and smart cooking. It features stainless steel mirror finish to make your space look elegant. You can put this compact cooktop to the counter space. It has brass alloy burners for even heat distribution and great cooking experience. It is also easy to clean. It ensures efficient and fast cooking and save your gas. All the products from Sunflame are long lasting and provide more efficient cooking experience. Sunflame is the most loved and trusted household brand in India with its promise and fulfillment. It is definitely the best choice of customers. This time, it brings GT Pride 3 burner glass top gas stove with elegant finish. It features tough glass top making it ideal for families with 3-4 members. The knobs are ergonomically designed to make it easy to operate. Enhance your cooking time by placing three vessels or utensils on this stove. It’s time to upgrade your old-school 2-burner steel gas stove to Sunflame GT Pride 4 burner glass top gas stove and make cooking a lot faster and smarter. It is a beautiful glass top gas stove with shatter-proof toughened glass and 4 burners to make your kitchen smarter. The four knobs are ergonomically designed and easy to use. It has tri-pin burners in different sizes to cook different dishes. The glass top is easy to clean and spill-proof to add elegant and sleek look. Morning has crazy and rush hours where you have to prepare breakfast and lunch boxes at the same time. It is the case of almost all households in India. You can now cook different dishes easily and smoothly with Sunflame Pearl 3 Burner Glass Top Gas Stove. It features 3 different sized and ergonomically designed brass burners which are spaced well to cook 3 different dishes at the same time. These high quality burners are designed for smooth cooking and they have three rows of flames to improve fuel efficiency. 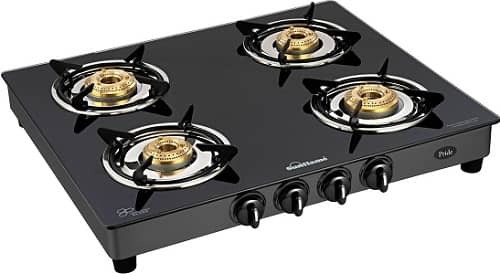 Designed with four well spaced burners, Sunflame Pearl 4 Burner glass gas stove can cook four items at the same time and saves you much energy and valuable time during rush hours in the morning. Each of these brass burners have three rows of flame designed for even cooking. 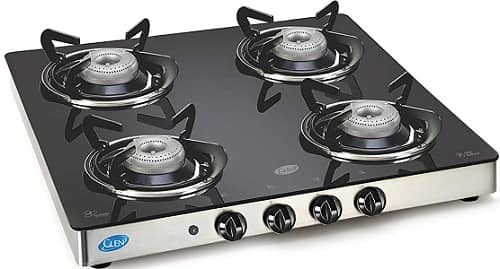 Sunflame Classic 3B Burner Gas Stove has been designed well with 3 burners for safe and smart cooking. It features stainless steel mirror finish to make your kitchen elegant in looks. It has brass alloy burners for even heat distribution to ensure efficient cooking while consuming less LPG. Here was the list of some of our best picks from Sunflame. We hope you enjoyed the article and decided which gas stove to choose. If you have any query, feel free to comment below.